Surprise, nerds! It is I, the nefarious Kris Lexia! Bet you thought you’d seen the last of me! Unfortunately, not. It’s the triumphant return of the youngest member of the Lexia clan, here to continue the time-honored tradition of abusing one’s body with too much junk food. And what better time for it than my absolute favorite time of year: HALLOWEEN! It’s the most important two months of the year, and if you celebrate any other way, you’re doing it wrong. We all know as soon as the clock strikes midnight on October 31, the stores skip over Thanksgiving altogether and move straight to the ring-ting-tingling bells of Christmas. So I’ve taken it upon myself to help keep the spirit of all things spooky alive while it’s still topical. As many stereotypical twenty-something white girls do, I love seasonal snacks. And yes, I will buy anything that even looks like it might taste like pumpkin. But since this isn’t Buzzfeed, I’m not going to talk about that. Instead, I am going to take you on a culinary adventure in my apartment. And by that, I mean I’m going to take pictures of everything I managed to cram into my empty pie hole this morning for breakfast. I have no shame left, guys. 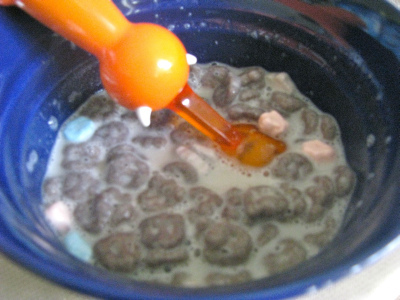 I started off my morning, as all good little spooks do, with a heaping bowl of Boo Berry. 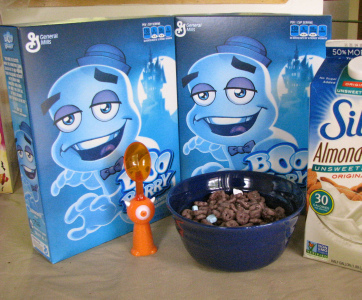 I go out of my way to have at least 2 full boxes of Boo Berry in my apartment throughout the season. Not pictured is a third box of Boo Berry that I killed to write this for y’all. You’re welcome. Today, I paired it with some almond milk because I cannot be trusted to drink a whole carton of proper milk before it curdles. If I’ve learned anything this fall, it’s that expired food is scarier than most horror movies. Save yourselves, before it’s too late! 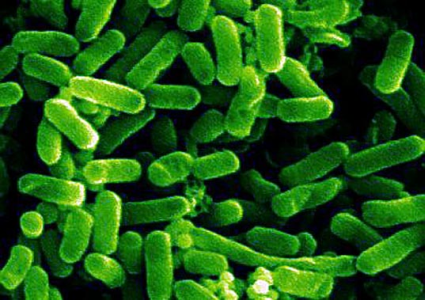 E. coli is on the loose. Moving on, let’s go back to the cereal. For those unfamiliar, each Halloween season General Mills puts out a series of spooky cereals with the three mainstays: Count Chocula, Boo Berry, and Franken Berry. For 2013, they brought back the long-retired Fruity Yummy Mummy and Fruit Brute, but it seems that they’re not making another comeback. And there’s more to the gimmick than just a spooky name and box art. Oh no, there are MARSHMALLOWS. As a kid who didn’t grow up with lots of sugary cereals, marshmallows in cereal are a mystery to me. I was never a big fan of the texture and left my Lucky Charms to go stale when I finally convinced my mom to buy it for me. I think this was partly because I didn’t like milk in my cereal and cereal marshmallows are just better when they’re revitalized by the healing powers of milk. And lemme tell you, milk does more than just make your marshmallows soft and sticky. 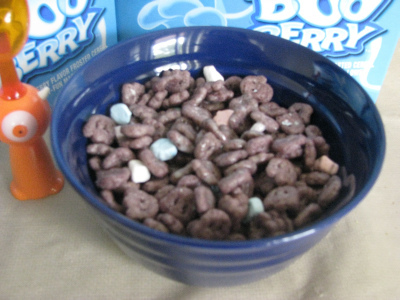 In the land of Boo Berry, it dyes your milk a killer purpley-blue. Honestly though, photos can’t do it justice, in part because it is goddam hard to get a camera to focus on cereal, but take my word for it: a bowl of blue joy awaits. 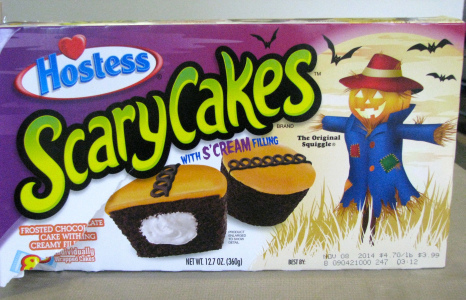 Next up are Hostess Scary Cakes, which I could not manage to take a picture of before desecrating the box. Hostess is no stranger to holiday-themed and otherwise branded snack foods, but I think these take the cake. Sure, they aren’t neon green like the Glo-Balls of yore, but look at that packaging! A cheerful scarecrow flanked by bats is inviting you to tear open your own box of scary cakes. Will it turn you into a happy scarecrow? 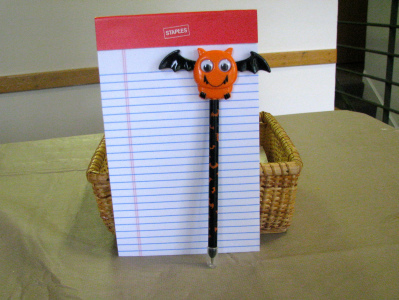 Will you feel about fifty percent spookier? These are the burning questions I'm left with. Once you unbox and unwrap one of these bad boys, you get the customary Hostess faire: chocolate cake with a puff of (s’)cream filling and that bizarrely textured frosting. If you grew up with Hostess, you’ll probably scarf these down without a thought. But to me, Hostess Cupcakes are not my first snack cake choice; there was no incentive to buy these outside of that amazing packaging. 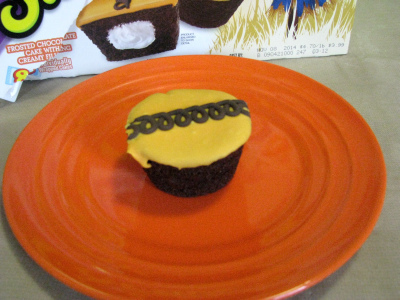 Now some Halloween-themed Donettes would really catch my eye. Think about it, guys, spooky sprinkles on your delicious chocolate mini-doughnuts. 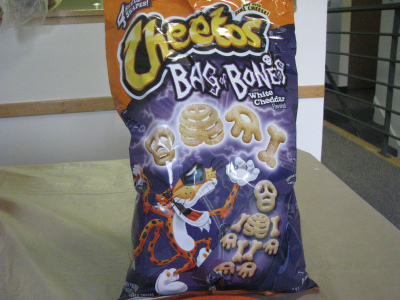 When I spotted the Bag of Bones, I had to resist the urge to buy an entire display’s worth of bags. Just look at how genuinely creepy Chester Cheetah is, cackling over his cheesy creation. 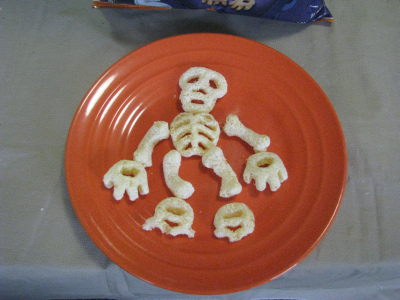 He’s practically inviting us to join him in his spooky cheddar laboratory, reaping the delicious benefits of his handiwork. Naturally, I answered the call of Mad Scientist Chester Cheetah, as should you all. Let’s take a moment and focus on the best part of the skeleton: the skull. These reminded me so much of my favorite childhood puffed-cheese snack product: Cheez Doodle Heads. Check out this little skull. 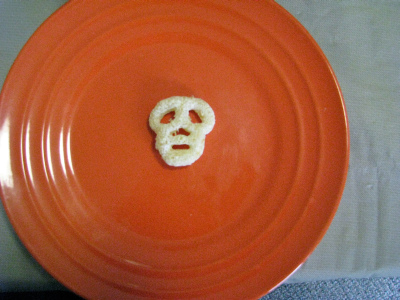 He looks so miserable, like he’s just begging to be taken out of his delicious, white cheddar misery. Who am I to argue with someone so delicious? 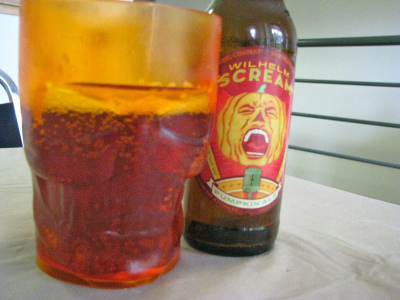 By this point in my meal, I was starting to feel a little parched, so what better to wash down this shameful meal than a nice tall skull full of Pumpkin Ale. I’m going to be straight with you: I am not a big fan of beer. 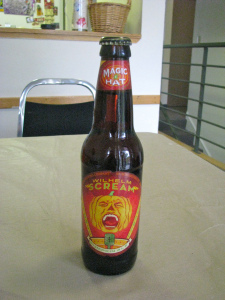 I have asked my friends who are beer drinkers their thoughts on this particular brew and they found it a bit funky too. And, surprisingly enough, it is much more palatable warm. So I downed this sucker warm. But that wasn’t enough to get me through the morning. 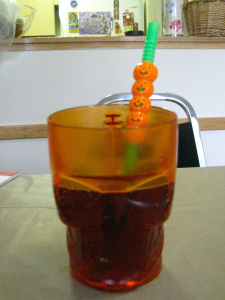 As the baby of the Lexia clan, I naturally had to add a spooky straw to make the whole experience more tolerable. So there you have it. A very seasonal breakfast. I really wanted to break out the pumpkin spice and apple-related treats I have as well, but I already felt a little queasy by the time I made it to the Cheetos. Maybe next time I’ll pace myself, or try for a smaller goddam bowl of Boo Berry. Fat chance on that one. EDITOR'S NOTE: SYDLEXIA.COM DOES NOT ENDORSE ALMOND MILK. IN FACT, WE FIERCELY AND OPENLY CONDEMN IT.